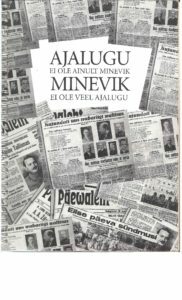 This publication is a result of the project “Integration of Society in Estonia: A combined approach for history and public debate”. This project aims to intensify the mutual integration of the population of Estonia, especially with regards to the Russian speaking group. The approach of this project runs on two parallel tracks. First to start an organised and guided dialogue between journalists, politicians, academics and teachers about the topic, and second to develop educational material for history and civic education, to train teachers how to use it and to provide it to as many schools and teachers as possible. The outcomes of the dialogue will be implemented in the educational material and the material will be assessed and discussed in the dialogue. The result will be an intensified public discussion and public awareness of the problem of integration and a balanced high quality approach for education which will be actually used in schools. Local Coordinators: Eero Medijainen, Mare Oja. Authors: Mart Kand, Eda Maripuu, Sergei Teplov, Vjacheslav Zhiburtovich. Resourcers: Veera Korelskaja, Tatjana Michelson, Silvia Oispuu, Katri Raik, Reet Salu, Anu Toots. International experts: Roger Austin, Sue Bennett, Teresa de Seabra. International Observers: Evaldas Bakonis, Danguole Bylaite, Tatjana Koval. Dutch Embassy: Mr. Karmo Kroos, Mr. Tanel Matlik, Ms. J.M. van Vliet.